Unlike the usual flamboyance displayed during their independence day celebration, Nigerians no longer celebrates October 1st with pride and aura of respectability. The essence of such jubilation and drive to make Nigeria survive on its own without influence from external bodies like (Britain and U.S) and internal crisis rocking the British estate as a result of the Biafra restoration project, has killed off the spirit of celebrating independence day; because real time events has shown that Nigeria still depends on Britain to help sustain this unwholesome unity of Arewa, Oduduwa and Biafra, and by proxy, depend on crude oil from Biafra land. what independence are you talking about? Was Nigeria ever free from the grip of Britain? 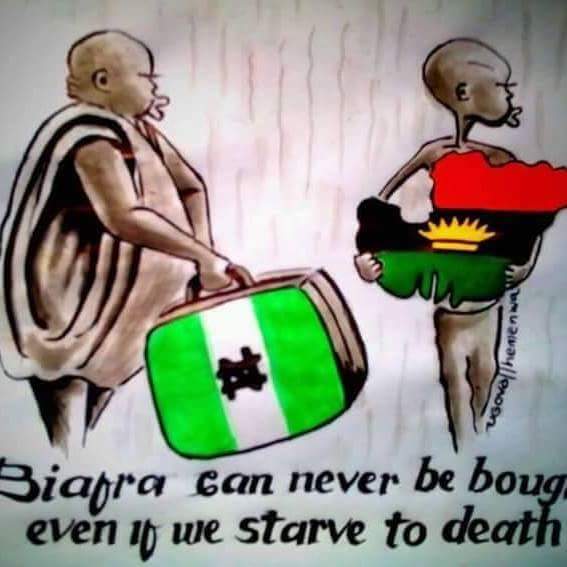 Is Nigeria whose sole survival depends on Biafrans and their God-given resources from Biafra land really free? Buhari practically got to Aso rock because of Obama and David Cameron, hence his countless visit to them. We can tentatively say that Buhari and Nigerians depend on them for survival. The unfolding events since the launch of the "OPERATION RED ECONOMY" by the dreaded Avengers upon the ignoble British creation is a pointer to Nigeria's dependence on Biafra. Since the Avengers started the bombardment of various major pipelines in Biafra region, Nigeria’s economy has crippled. The production and sale of crude oil drastically reduced to near-zero level, and is not about to stop until the mission of the great freedom fighters is accomplished. Just yesterday the 30th of september, a day to this inglorious day of the so called " Nigerian independence day celebration", it was reported on various media platforms that the Naira is now pegged at 500 to a Dollar. Nigeria’s currency plummeted more than 50% against the dollar, the latest sign that low crude-oil production, prices and sales continue to disrupt the economies of the fraudulent contraption. All of this is as a result of the constant pipeline vandalisation by active freedom fighters In the region, and Buhari the illiterate doesn’t seem to understand the impact of coercing Biafrans to remain in Nigeria. Nigerian leaders, both in the past and present still dangle like bangle in front of the British government. They report to her, receive counsels from her and are British intermediaries for carrying out their agendas. Nigeria is very much under British colony as at before 1960. What do they mean by celebration? Are they celebrating the negative change rocking their entity? Are they celebrating the negative wind of chains blowing poverty, hardship and death on the masses in the land? Or, they are celebrating unaffordable food stuffs, fuel hike from N87.00 to N 145.00 per litre and the continuous inflation of transport fares, etc. The lists is endless, How many people can afford three meals a day? How many can pay hospital bills and constantly increased house rents? Suicide rates have increased under the watch of the deadly 'CHANGE' agent, Buhari. Ritualists are splitting human bodies like wood trying to make blood money in a bad economy. Could it be that they want to celebrate this economic recession or power monotony? I wonder. It is better, they learn from the indigenous people of Biafra(IPOB) and mourn this shameful, sorrowful and unfortunate death of a once so called giant of Africa, whose sudden fall is resonating round the globe. This embodiment of death, called Nigeria, ( yes Nigeria represents death) must never be allowed to continue existing. The almagamation as signed by the British and our forebears has expired. Nigeria has not and will never be workable with people of dissenting views and ideologies forcefuly lumped up together; the only solution to this pain brought upon us by Britain is immediate dissolution of the unholy union. I look up to the sky and behold our sun is smiling again because her reign is nearer than imagined. Director Nnamdi Kanu had prepared us for today's events, there is no going back. Biafra is here to stay but Nigeria has gone into flames.